What is a private cloud and what are the key benefits? There are many misconceptions surrounding the private cloud. For example, many people tend to believe that — since a private cloud is “private” — it must be hosted on–site (thereby, making it more private). But that’s not exactly true. A private cloud can be on- or off-site, and it can provide your company with a variety of long-term benefits. It operates similar to a public cloud but resources are simply managed differently. What are the key benefits of a private cloud? The cloud offers a variety of benefits. This is true both for a public and private cloud infrastructure. While some benefits (like management and cost-efficiency) might not be as great in one cloud versus the other, other benefits (like scalability and performance) are very much present. Let’s take a quick look at the primary benefits of a private cloud. Many organizations decide to go with a private cloud because they’re confined to a specific set of requirements. Although a public cloud is secure, it doesn’t offer the same level of control, customization, and privacy that a private cloud can offer. However, this doesn’t mean that just anyone can tap into a public cloud and access the information stored in it. 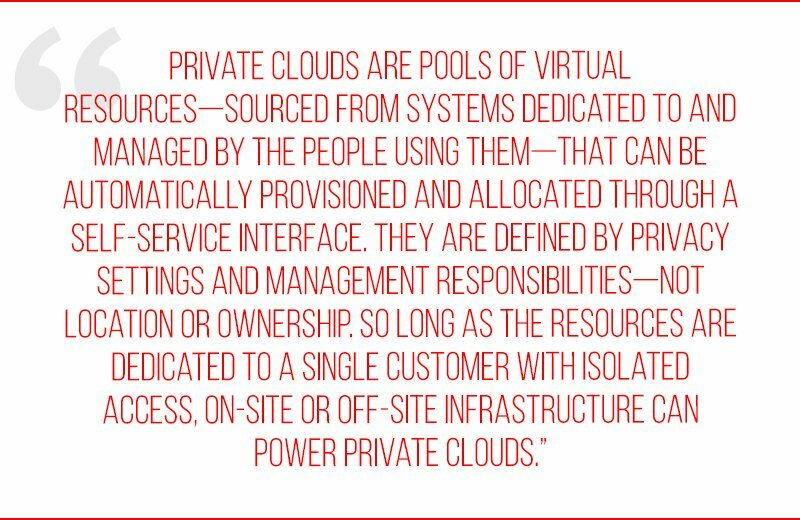 Resources are “private” in a public cloud; they’re just shared (theoretically reducing privacy). In general, the cloud typically offers greater resource efficiency — and this remains consistent from public to private. In some cases, however, a private cloud might be more efficient than a public cloud. This is because you’re pooling resources that are only dedicated to your organization. If you’re looking to migrate to a private cloud environment, it’s important to do your homework first. Research managed cloud providers and what they offer, the various platforms and how they can support your organization, and the pros and cons of both onsite and offsite hosting. If you’d like to keep reading, take a look at IaaS, PaaS, and SaaS. https://www.strongholddata.com/wp-content/uploads/2018/09/stronghold_Private-Cloud_Feat_Image.jpg 266 757 Stronghold Data /wp-content/uploads/2017/06/StrongholdDataLogo.png Stronghold Data2018-09-11 15:02:232019-01-17 17:58:04What is a private cloud and what are the benefits?